Keeping our herbs fresh longer. Basil hates the cold. There’s no softening the truth of it. Turns all black and soon slimy if put in the vegetable bin of the refrigerator. If it can’t be in the sun, basil likes being out on your counter, in the warmth of your kitchen. Give the stems a fresh cut, put them in a glass of tepid water, cover them with a plastic bag or cloche and they’ll last for days and days. They may be so happy they’ll put down roots. If you won’t be able to use your basil up before it starts to wither, you can puree it with olive oil, spoon into ice-cube trays and freeze. Once frozen, spill them into a zipping freezer bag where they’ll be happy for ages. On the other hand, Cilantro (aka fresh coriander) doesn’t seem to mind the cold of the fridge. But it does still prefer its stems in water. Give the stems a fresh trim, place them in a glass of water, cover them loosely with a plastic bag and place on a shelf in your fridge. They’ll be happy for a good week. (Possibly more.) Parsley (when asked) prefers the same treatment as cilantro. If you can’t decide what to do with all that parsley within the week – try turning it into salsa verde! So easy to make, and it’ll freshen up just about anything you drizzle it on. Sage will be happy in a refrigerated & covered glass of water too. Best to change their water every couple days. What a great way to look after Basil, he is rather temperamental to say the least and deeply sensitive! Fab photo Spree., I shall have to keep my eyes open for a bell jar …. Glad to see the return of Spreenkle! You always include such helpful info, Spree, and this one, given our sub-freezing temps, is especially well-timed. Few in this climate will have any fresh herbs to pick and will have to rely on store-bought. Without proper care, we’re basically buying fresh herbs for a one-time use. I love those old cloches too John. Anything glass that survives that many years I suppose warrants a price but it does move them out of the realm of reasonable for most of us. I bought this one for a pittance…I’m wondering how successful I might be at acid etching and otherwise distressing a new one to give it an old look? Might be worth a try. Great tips and what a beautiful shot! We buy a big living basil plant (Trader Joe’s has them). Then we keep it in sunny window. This year it is producing new leaves in December — seems so odd to have fresh basil at this time of year. You have elevated the storage of herbs to an art! I had no idea I could do something so lovely with my basil! I’m going to find me an old cloche or a cheese dome at a thrift store! The basil shot gets my inspiration flowing. The cilantro shot stops me in Awe. Or ahhhhhhhh. Ahhh thanks Carolyn! You find an old cloche for your kitchen and it will give you such pleasure,I just knows it! A lovely guide to storing herbs. Sadly, I seem to through far too many away past their prime. Fortunately, I’m still getting some herbs from my garden, so fresh is always available, but not for long, as winter is approaching. 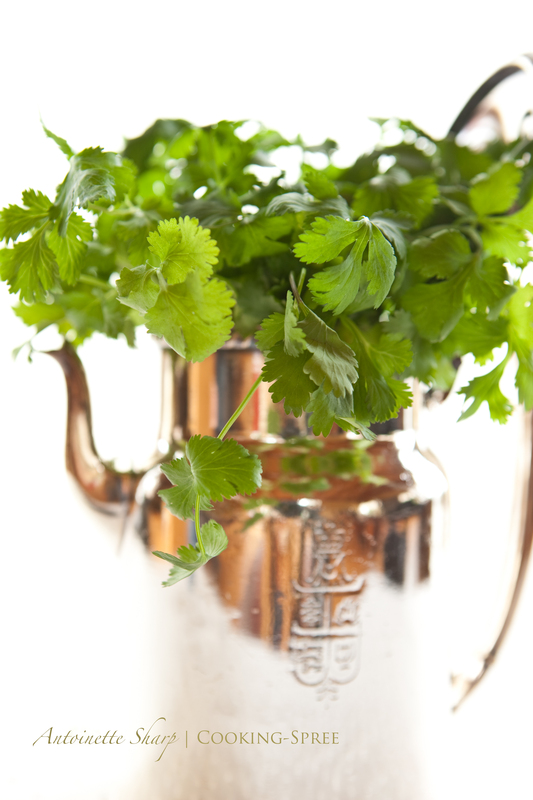 It seems we all end up throwing away too many fresh herbs, and that comes at a price for sure! (I don’t want to think about how much green I’ve tossed away!) lucky you to still have some herbs to pick from – I have rosemary, oregano and thyme too, but several, and that most favorite of mine, is gone til summer. Remind me where you live again Mar…. I’m in London (the other one, in Ontario, Canada). By rights, we should have snow already, but it’s been quite mild this winter. Even so, there’ve been years where I’ve been able to pick sage and rosemary even after the snow flew, at least for a while. I just love my fresh herbs! Thank you so much Sawsan…happy that you like the Spreenkles! lovely tips, now I have another reason to find a beautiful glass cloche !! Good tips! Beautiful photos, and I love your new cloche! Cloches….fresh green herbs….lovely photos? Very nice indeed. Wow, that basil must be feeling seriously happy it ended up in your kitchen! Lovely shot too..